Some people have a hard time really jumping into something and so sometimes they might hesitate a bit too much. Hesitation can cause people to miss out on things, but it sometimes comes from a desire to really be prepared for their next step. 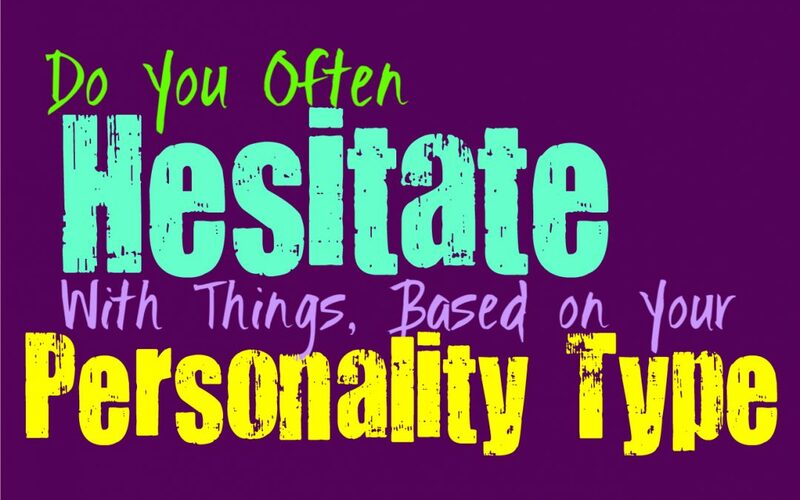 Here is how often you hesitate to take action, based on your personality type. INFJs do sometimes hesitate in situations where they don’t feel quite prepared for what comes next. They prefer to be ready for things and don’t like just jumping into something without really knowing what is going on. They don’t like hesitating on the more important things that they might miss out on, but at times they can’t quite help it. INFJs just don’t like feeling like they are hopping into something when they should be taking a step back. Most of the time INFJ use their intuition to decide whether or not they should hesitate or take the occasional chance. ENFJs don’t like hesitating when something is important, and so they often follow what their intuition tells them. If they feel ill prepared for something they sometimes find themselves hesitating to move forward. ENFJs believe in being ready for whatever comes next so that they can navigate it properly. Sometimes their desire to be perfect can make it difficult for them to really jump in without taking time to be sure they are ready. There are times when this causes the ENFJ to hesitate if they are unsure how their actions might turn out. INFPs don’t like hesitating on things that matter most to them, but there are moments when this does occur. INFPs can be a bit nervous to jump into something if they feel like it will cause them to miss out on something else. They also have moments where they might lack motivation, and this can make it difficult for them to really jump in without hesitation. INFPs do try not to hesitate though, especially when they are truly passionate and excited about something. ENFPs don’t generally hesitate they enjoy being able to jump into something new. For the ENFP remaining stagnant is draining, they really want to dive into something more fulfilling. They realize that hesitation can cause them to miss out on something and they often become too eager for this. ENFPs will definitely avoid hesitating when there is something they are passionate and excited about. They do their best to really dive into the things they are truly excited for, without allowing fears to hold them back. INTJs don’t really hesitate, they simply strive to be prepared. When it comes to things they should be aggressive with and ready to jump in, they certainly will do this without hesitation. Where the INTJ might sometimes hesitate with things, is when they might be more emotionally invested in a situation. If they feel like they aren’t leading with their minds then they will want to take a step back and really analyze their actions before jumping in without hesitation. In most situations INTJs strive to be prepared, but they use their intuition in order to make choices and don’t like waiting when they should be acting. ENTJs don’t mind diving into situations and do their best to ensure that their actions are the right ones. ENTJs believe in always being prepared but that does not mean they will hesitate. In most situations they are fully away of what they want and so this helps them remove hesitation. They work hard to get things done and will go after their goals with a sense of aggression. In most situations ENTJs do not hesitate and will already be prepared to take action when they need to. INTPs do sometimes hesitate, mostly because they analyze things for a long time. There are some situations where they want to consider every angle and all of the possible outcomes, and this can cause some hesitation. When the INTP is sure about something they are capable of moving forward, they simply don’t always find themselves feeling the motivation to take that next step. They simply enjoy analyzing things and imagining where it might lead before they actually more forward with it. ENTPs don’t enjoy hesitating, and often prefer to take action. When they are excited about something they often jump in without feeling the need to really prepare themselves. ENTPs are eager to dive into things and really experience what is available to them. While they don’t feel the need to constantly prepare for everything, ENTPs do enjoy analyzing and considering if they should take the risk. For them it is about following their passions and seeking out new experiences. ISTJs don’t like hesitating when they know they should be taking action. While they don’t like jumping into things unprepared, they also don’t like hesitating on important things. When they are sure about their actions they will definitely not be afraid to really dive in. ISTJs prefer to go after the things they want in life without allowing anything to hold them back. They are strong-willed people who believe in accomplishing their goals with a sense of precision and efficiency, and this means not hesitating when they should be moving forward. ESTJs don’t like hesitating when they know they should be moving forward or taking action. They are aggressive when they have goals in front of them and don’t like allowing anything to stand in their way. While ESTJs believe in being prepared for everything, they do their best to do this before the moments come where they need to really take action. If they feel like their emotions are standing in the way of their decisions then they will hesitate a bit and take a step back before moving forward. ISFJs don’t like hesitating when they should be moving forward, especially when the needs of their loved ones are at stake. ISFJs do their best to be prepared for things and want to be sure they are doing what is right. When they really need to take advantage of a situation they do their best to ensure that they don’t hesitate. There are some moments when the ISFJ might be fearful of taking those next steps though, and in those situations they can sometimes hesitate when they shouldn’t. ESTJs don’t believe in hesitating when they should be taking actions or going after something. They do their best to be prepared for the future and don’t like missing out on important opportunities. ESFJs care about taking care of their loved ones and want to do whatever they can to make them happy. There are moments when the ESFJ might be a bit fearful of change, and in those circumstances they might hesitate a bit. This is something they try to avoid but there are times when they might be unsure of their next move. ISTPs definitely don’t hesitate, especially when there are things they want to do. They enjoy diving into new situations and aren’t afraid of taking risks. While ISTPs are willing to take chances in order to experience something rewarding, they can sometimes jump into things without fully thinking of consequences. For the ISTP it is more important to seek out the things that provide them with value and sometimes this means diving in headfirst. ESTPs aren’t afraid of taking risks and so they rarely hesitate when there is something they are excited about. They are passionate people who believe in going after the things that mean the most to them. ESTPs are eager people who strive to enjoy their lives with a sense of passion and adventure. They don’t like feeling held back or hesitating when they should be taking action. They value being someone who isn’t afraid of the future, instead they want to really feel free to make their own choices. ISFPs don’t like hesitating and rarely do they allow doubt to hold them back in life. They go after the things which fulfill them most and believe in always following their hearts. ISFPs move towards what inspires them and they don’t like allowing fears to stand in their way. They want to do what is right for them, and because of this they don’t believe in hesitating when they know they should be stepping forward. ESFPs are not likely to hesitate, especially with the things that they are excited about. They don’t like allowing their thoughts or doubts to hold them back, instead they believe in going after what they want. ESFPs are passionate people who are eager to really dive into new things and experiences. For the ESFP it is best to live their lives with a sense of willingness and adventure. They aren’t afraid of taking chances, they would rather jump in than hesitate.